Tokyo, March 1, 2019 – Subaru Corporation announces the following organizational changes which will take effect on April 1, 2019. To enhance the effectiveness of internal controls and risk management by consolidating and abolishing organizations and clarifying reporting lines. The Compliance Office will be reorganized to form the Risk Management & Compliance Office. In addition to the function of strengthening the company’s efforts to comply with laws and regulations, this office will take on the roles of planning and implementing group-wide internal controls and risk management. The CSR & Environment Department will be reorganized to form the Sustainability Promotion Department. In addition to the function of promoting CSR and environmental efforts, this department will take on the roles of planning and implementing group-wide activities from an ESG perspective. To facilitate responses to future changes in the market environment and enable management strategy to more promptly reflect product and market initiatives, including those to address environmental challenges. The Corporate Planning Division will be established, and the Corporate Planning Department, Market Strategy Department (newly established), and Logistics Management Department (newly established) will belong to this Division. The Global Marketing Division will be dissolved, and its tasks and functions relating to the product portfolio, market research and analysis, and the Subaru brand will be transferred to this department. 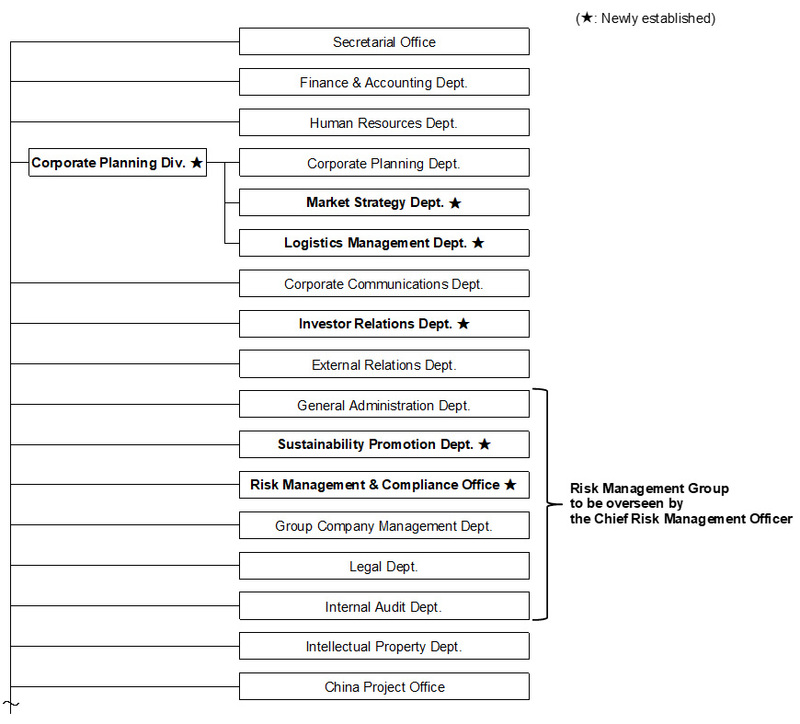 The new department will plan and implement brand, product, and market strategies under the Corporate Planning Division. The Business Planning Department will be dissolved, and its logistics-related tasks will be transferred to this department. The new department will plan, implement, and coordinate group-wide logistics strategy under the Corporate Planning Division. To facilitate constructive engagement with shareholders and investors, with the goal of achieving sustainable growth of the company and increasing corporate value over the medium- to long-term. Investor relations functions in the Corporate Communications Department and shareholder relations functions in the General Administration Department will be consolidated under the newly established Investor Relations Department. The “Tadashii-Kaisha” Promotion Department will be terminated, and its function will be incorporated in the Corporate Planning Department. The Subaru Next Story Promotion Office will be terminated, and its function will be incorporated in the Japan Sales & Marketing Division.